Historically, the construction industry has been labor-intensive and slow to embrace emerging technologies. One could argue that it’s been generations since the industry has experienced significant changes in methods and processes. But all that is changing, as recent advancements in automation and technology propel the industry from the past, beyond the present, and into the future. Automation – the automatically controlled operation of a system by mechanical or electronic devices – improves productivity by increasing the accuracy and security of data, while reducing production time and manual error. From design and drafting to the assembly stage, automation is transforming the entire construction industry. Software and Modeling and Rolling, Oh My! For centuries, the task of drawing and drafting blueprints for residential and commercial buildings was maintained in relatively the same fashion. Even in expert hands, it remained time-consuming and arduous. Lack of standardization, refined measurement capabilities or comprehensive collaboration created wasted materials and errors that led to loss of financial and time investments. Advances in architectural design and drawings have already come a long way from hand-drawn sketches to sophisticated software and computer aided-design. Beyond the capability of creating standardized blueprints and diagrams, building information modeling and 3-D printing methods may be the most exciting development on the manufacturing horizon. Building Information Modeling (BIM) is an advanced 3D model-based designing software that provides insight and allows construction professionals to efficiently plan, design and construct buildings and infrastructure. BIM provides a more consistent and accurate process to create standardization across projects, saving time, money and materials. Further, BIM enhances collaboration across teams and provides a common perspective to all parties involved in the undertaking. 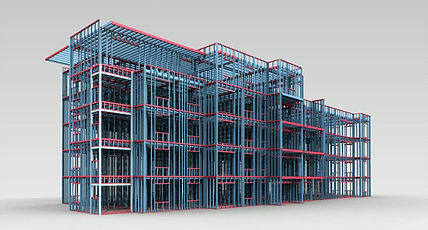 BIM software allows designers to automatically assemble building configurations in seconds. Traditional production errors from incomplete or conflicting data are eliminated as changes can be made virtually in real time. Available software tools are able to convert files and import 3D models from several architectural applications and deliver IFC files to contractors. This seamless transfer streamlines design processes by replacing manual trace-overs and re-modeling phases. Steel form rolling, or steel framing, has improved dramatically with technological advances. Steel framing machines save time and labor by creating fully processed framing components. These products allow builders to snap studs together and construct walls, floors, or trusses without assembly jigs. Products are designed via software and sent to machines for production. These machines eliminate the waste associated with traditional methods (up to 10-15% of wood or steel). In the construction industry, it may take some time before these practices become commonplace. However, the future of automation is being paved – one design, model, and structure at a time.